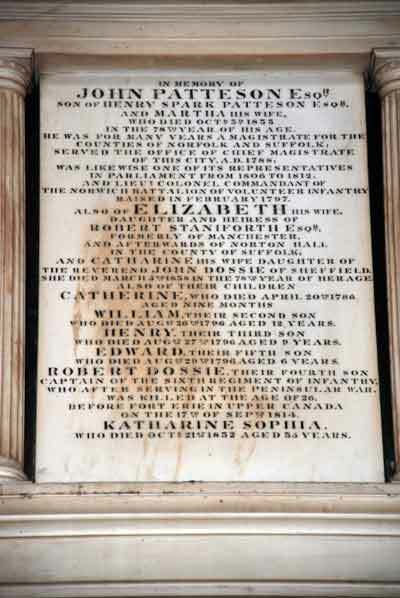 John Patteson, son of Henry Spark Patteson and his wife Martha (nee Fromanteel) lived a full and eventful life. Despite inheriting his Uncle’s estate and marrying Elizabeth Staniforth, described on their monument in St Peter Mancroft as an “heiress,” following; a number of unsuccessful business ventures, the failure of his bank and his enjoyment of a lavish lifestyle he died in somewhat straitened circumstances. 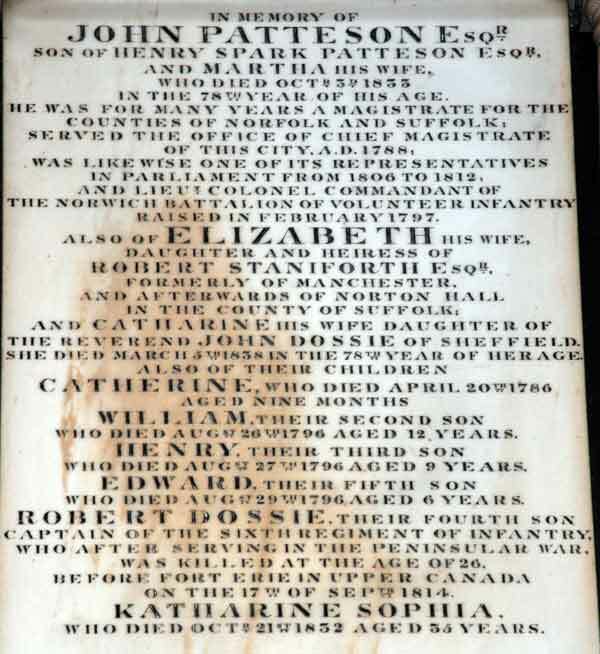 John’s father Henry Spark Patteson (an ironmonger) died when John was nine, at which time he and his mother went to live with his Uncle John . He was educated initially at Greenwich but when he was 13 he went to Leipzig to learn foreign languages to enable him to work in the woolstapling business with his uncle. At the age of 19 he inherited his uncle’s estate and in 1781 he married Elizabeth. 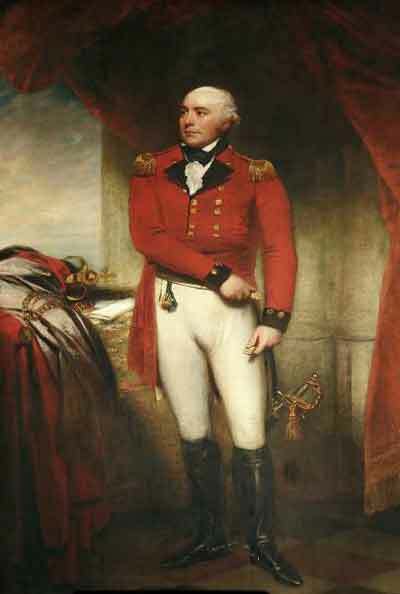 From 1781 – 1831 He served on the Norwich Corporation during which time he held a number of political/ civic positions including : sheriff in 1785, mayor in 1788, MP for Minehead between 1802 – 1806 and MP for Norwich 1806 – 1812, lieutenant – colonel of the Norwich Volunteers in 1803. He was also well known for more worldly pursuits and is reported as being the first in the city to drive his own private chariot! In 1793/4, with the aim of finding an occupation for his son John Staniforth he started to buy various brewing interests. These included : the Great Yarmouth brewery of William & James Fisher (including 17 public houses), the James Beevor and Jehosophat Postle Breweries and public houses belonging to James Day. Other business ventures included his directorship of the Norwich Union Life Society, where in 1818/1819 he and his son “helped oust” the management of Thomas Bignold in favour of his sons ; Samuel, John Cockedge and Thomas. It was also in 1819 that his wealth diminished at this time he disposed of pictures at Christies which realised £2439, all of his estates including Colney & Bawburgh and his Surrey Street House. The latter was bought by Samuel Bignold and became the HQ of the Norwich Union Fire Society known as Bignold House. He retrenched to Mangreen Hall and accepted £50 a year from the Corporation as a “grant to a decayed alderman.” Unfortunately even this was not sufficient and he eventually moved to St Helen’s vicarage. Meanwhile he withdrew from Brewing in favour of his son John Staniforth Patteson and in 1820 the company of Steward, Patteson and Stewards was formed. Income form this venture enabled John Satniforth to gradually discharge his fathers liabilities. The Patteson name lived on at the brewery (which became Steward & Patteson Ltd in 1895) until 1966 when it was taken over by Watney Mann. The monument is very plain. It does, however, give details of John's various public offices and Elizabeth's (1760 - 1838) and details of six of their children (John Staniforth has his own monument). Four of their children died under the age of thirteen: Catherine (1785 - 86) only survived for nine months. However it is particularly poignant to note that the other three; William ( aged 12), Henry (aged 9) and Edward (aged 6) died within three days of each other in August 1796. Norwich Heritage Projects is a voluntary group which receives no funding and make no profit.